This is one of our private Oman tours. This is our longest published tour of Oman, combining visits in the north and south of the country, plus a night in the Wahiba Sands desert. Upon arrival at Muscat International Airport, you will be met and escorted to a lounge to relax while our representative retrieves your luggage and handles the immigration procedure for you. Then you will be transferred to your hotel in Muscat for overnight. After breakfast at the hotel, meet your guide and begin your Muscat tour. Your first stop is the Royal Opera House, the leading arts and culture organization in Oman. Then visit the Sultan Qaboos Grand Mosque. Built by the Sultan for the 25th anniversary of his accession, it is the 5th largest mosque in the world. The mosque is an architectural masterpiece and houses some outstanding works of art. Continue to Al Alam Palace, where the sultan receives state guests. The palace is flanked by two 16th-century, Portugese fortresses, Al Jalali and Al Mirani. Then visit Bait Al Zubair museum, which celebrates the culture and heritage of Oman with extensive permanent collections as well as special visiting exhibits. Next, we’ll take a break in an area where you can sit and walk around and select your restaurant for lunch. After lunch, continue along the corniche to Muttrah Souk, the oldest and largest market in Oman. You will have time to explore the picturesque, narrow alleys, where the air is filled with the scent of frankincense and sandalwood. Shop for Omani souvenirs such as pottery, paintings, shisha pipes, framed khanjars, leatherwork and incense. Stop at one of the shops for a demonstration on mixing perfume oils. Alternatively learn about the use of spices and herbs for health benefits and cooking. Today’s adventure begins in Wadi Arbiyeen, where the karst plateau of the eastern Hajar Mountains towers 1500 m above the coastal plain. Drive through the wadi and visit the idyllic waterfalls followed by a stop at Bimah sinkhole with its azure saltwater pool. Continue to the green Wadi Tiwi for lunch and time to stretch your legs. Continue on to Sur, once an important hub for trade with India and China. The typical Omani dhows are still built in Sur and can be seen in the port. A restored 8th-century dhow, the Fatah Al Khair, is on display in the open air museum. In the evening, visit the turtle reserve in Ras Al Jinz or Ras Al Hadd to watch Green Turtles coming ashore to lay eggs. This endangered species is protected by the Omani government. Local rangers are on hand to ensure that no visitors disturb the animals. Spend some time at Oman’s most popular wadi, Bani Khalid. Lush vegetation lines the wadi’s ever-flowing stream, with scattered turquoise and emerald pools. The springs of Ain Hamouda, Ain al Sarooj and Ain Dawwa are a blessing to the eye as you venture along the valley. Lunch en route. Continue to the red sands of the Wahiba, a virtual sand sea with great dunes up to 200 km in length and 200 meters high. The desert is 100km wide, from the eastern Hajar Mountains to the Arabian Sea. Take a thrilling ride through the dunes, which are constantly changing shape and color. The Wahiba Sands are still home to two Bedouin tribes, the Nazaris and Jenebhas. Visit a Bedouin family for a first-hand experience of their legendary hospitality. Continue to your desert camp for dinner and overnight. Visit Ibra, where the many watchtowers on the surrounding hills tell of the city’s former strategic importance. On Wednesday mornings, the women’s souk is held here, the only market in Oman where merchants and clients are all women. (Alternatively, if time permits on a Thursday, visit the town of Sinaw, home to a lively souq where Bedouin women in their traditional dress meet to socialize with each other and trade with women and men alike.) Drive up onto Jebel Akhdar (Green Mountain), the country’s most fertile area, where terraced plantations grow apricots, pomegranates, peaches, grapes, almonds, walnuts and roses. Stop to enjoy the view from the Saiq plateau, 1,900 m above sea level. Continue to another view point, the so called Diana Point, named for the late Princess of Wales, who landed here by helicopter 1990 to take in the extraordinary vista. Lunch en route. Stop at some deserted traditional villages, where you will have time to casually explore on foot - Wadi Bani Habib gives a good idea of how the local people lived until approximately 1960. Birkat Al Mauz, a magical place, particularly during sunset, is surrounded by date plantations and aflaj, the ancient irrigation system. The water canals in this area are a UNESCO world heritage site. Continue to Nizwa for overnight. Visit Al Hamra, an old village restored by the government to show how Omanis lived in previous centuries. Continue to Bait Al Safah, a renovated building run by women of the village, who demonstrate traditional practices such as milling, cooking and more. Lunch en route. To the west of Al Hamra, take the road winding up Jebel Shams, the mountain of the sun. At 3075 meters above sea level, it is the highest mountain in the Arabic world. Pass the old village Ghul, with its green terraced fields. The inhabitants of this wadi are known for their fine goat hair rugs, which are in high demand throughout Oman. Some kilometers further you reach the abyss of the Omani Grand Canyon. Enjoy the breathtaking views before continuing back to Nizwa for overnight. This morning, tour Nizwa, one of the oldest cities on Oman, the former capital and still the religious center and silver capital of the country. Visit Nizwa Fort, Oman’s most visited national monument and a beautiful example of the historical military and engineering prowess of the region. The city, famous for its handicrafts and agricultural products, has an expansive souq located near the fortress, one of the busiest in the country. The market bustles with vendors selling everything from meat, fish, fruits and vegetables to spices, dates, gold and copper utensils. Silverware from Nizwa is regarded as the finest in the country. If your visit falls on a Friday, you have the opportunity to watch the bargaining at the animal market. The herders of the surrounding area bring animals to be auctioned once a week. Next, visit Bahla Fort, the oldest and largest fort in Oman. This castle, built by the Yarubas, is in the process of restoration and listed by UNESCO as a world heritage site. Although, it is still impossible to go inside, we will make a quick photo stop. Continue to the 17th-century Jabrin Castle, once a center of Omani learning. This particularly well preserved castle features ceilings decorated with beautiful paintings and carvings of Islamic motifs. The view from the top of the castle is mesmerizing. Lunch en route. Stop to visit Bilad Sayt, one of the small villages that has preserved its traditional charm and sense of rural seclusion, situated in the protective mountains of Rustaq. The quaint old earthen houses arranged on terraces around the foot of the mountain are typical examples of medieval Omani dwellings. Abundant palm trees and a patchwork of terraced fields are characteristic of the beauty of this region. Fresh springs supply crystal clear drinking water to the village and the aflaj canals distribute the rare commodity wherever it is needed. The wealth ends in the adjacent wadi, winding into the mountain range for approximately 7 km. Wadi Bani Awf lies in a deep canyon, the luscious date palms a vivid contrast to the rugged, barren mountains. While inhospitable, the mountains provide protection against the blazing sun. If time permits, we’ll stop at Nakhl fort and hot springs. Transfer to the airport in Muscat for your flight to Salalah. Upon arrival in Salalah, you will be transferred to your hotel for overnight. Drive a scenic, palm-lined road to the fishing village of Taqa, an old town with an interesting castle surrounded by watchtowers and Taqa stone houses. Incense and horses were once exported from the city’s harbor, guarded by the Qasbar Fort on the cliff above. Visit Taqa Castle, a fine example of 19th-century defensive architecture. Stop to enjoy the stunning hilltop view and then drive on to visit Sumhuram. On the cliff above Khawr Rawri, the Dhofar region’s largest bay, you will find the ruins of the fortress and the palace of Sumhuram, a UNESCO World Heritage Site and possibly the home of the Queen of Sheba. The Sumhuram port was an important center for the trade of frankincense, myrrh and slaves from the 1st to the 7th century. Lunch en route. Just outside Mirbat, you can see Bin Ali’s tomb with its white double domes. The tomb is surrounded by a large, unusually shaped cemetery with engraved headstones. Stop at the beautiful natural springs of Ayn Razat. Then drive into the Qara Mountains to see the tomb of the prophet Job, known locally as Nabi Ayoub. Continue to the magnificent sandy Mughsayl beach, surrounded by dramatic cliffs. Sea water shooting up through the famous blow-holes here can reach a height of 30 meters. Continue to Marnif Cave and the nearby lagoon, which is home to flamingos, pelicans and storks. Follow one of the roads leading up the mountains to the Yemeni border and enjoy breathtaking views of the limestone, volcanic mountains and gnarled frankincense trees before returning to Salalah. Begin with a city tour of Salalah, known as the “perfume capital of Arabia” and the largest city in the Dhofar region. 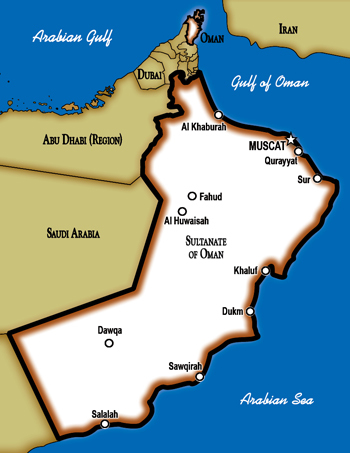 It was here that the first large free trade zone of Oman was built, accelerating the economic growth of the region. In 1940 Sultan Qaboos was born here and we’ll pass his local palace during this morning’s touring. Continue to the Al Baleed archaeological par, a UNESCO world heritage site. Al Baleed was an important trading port for frankincense and myrrh between the 7th and 14th centuries. The attached Salalah Museum houses many artifacts from that period. Pass the royal palace on the way to Haffa souk, where the fragrances of the orient come together. Visit the gold souk with a variety of gold and silver handicrafts. A visit to the food souk is interesting; the meat souk is more for the brave. Lunch en route. After lunch, transfer to airport for your flight back to Muscat. Upon arrival in Muscat, connect to your flight home. Want to see more of this region? Combine Oman travel with tours in Dubai and/or Abu Dhabi! The temperature varies in the different regions. Overall, the average October – March is 20º C - 30º C and April - September 31º C - 45º C. The Dhofar region (Salalah) has a subtropical climate between October - May with average temperatures of 30º C. But from June to September this region is exposed to the southeast monsoon that results in a lush green climate with temperatures around 23º C. Oman has 360 days of sun per year. A valid passport is required for entry into Oman. Tourist visas can be obtained upon arrival. Oman is a Muslim country thus it is important to observe a certain dress code. In public places, women should wear garments that cover their upper arms and legs. They should not appear in public dressed in shorts, tight trousers, bare-backed or low-cut dresses. Men should wear long trousers and shirts. Shorts and sun tops should only be worn at the beach or by the pool. When visiting the Sultan Qaboos Grand Mosque please ensure that you do not wear any sheer fabrics, transparent or tight clothes or white trousers. All trousers have to be long and sleeves should reach to the wrists. Women are required to wear a head scarf and cover their décolleté. When swimming in public places such as beaches and wadis, please wear T-shirt and shorts; this applies for women and men. The local currency is the Omani Rial (OMR) and there are 1000 Baizas (Bz) to 1 OMR. Omani Rials can be bought at major airports or upon arrival at Muscat International Airport. There are ATMs throughout the Omani cities. Credit cards are readily accepted. • 8 nights of accommodations with daily breakfast. • 7 lunches and 1 dinner. • VIP airport meet & greet & baggage assistance at Muscat on day 1. • Baggage assistance at Salalah airport. • Private airport transfers in Muscat and Salalah. • 7.5 days of private touring in an air-conditioned car or van, with a licensed, English-speaking guide, as per the itinerary. • Bottled water in touring car or van.